(i) Calculate the reciprocal lattice of the body-centred cubic (bcc) structure. (ii) Show that the reciprocal of the face-centred cubic (fcc) structure is itself a bcc structure. (b) Draw (101) and (111) planes in a cubic unit cell. Determine the Miller indices of the directions which are common to both the planes. ), calculate the effective mass of electrons for this energy dispersion relationship. Show that the motion of electrons near the conduction band minimum is isotropic. (c) For the diagram in part (b) above, explain why two of the allowed energy valence bands (V1 and V2) are referred to as "heavy hole" and "light hole" bands, respectively. (d) With the aid of simple diagrams show how the presence of a deep acceptor state can reduce the conductivity of n-type semiconductor. where a is the lattice constant, and EG and E0 are positive constants. In the first Brillouin zone we know that -Π/a ≤ k ≤ Π/a . (a) What is the minimum energy in the conduction band, and where can it be found in the Brillouin zone? (b) What is the minimum energy in the valence band, and where can it be found in the Brillouin zone? (c) What is the band gap energy of this material? (d) Sketch the band structure in the first Brillouin zone, explicitly showing the energies in each band at the zone centre and the zone edge. (e) Is this material a direct or indirect band semiconductor? (f) What is the conduction band effective mass at the conduction band minimum? (g) What is the conduction band effective mass at k=0? The cyclotron resonance for electrons in a field of B=0.1T occurs at an angular rotation frequency of ωc =1.8 x 1011 rad.S-1. (b) Assume that the semiconductor is doped with pentavalent donors. Estimate the number of donors per cubic metre, given that the Hall coefficient at room temperature RH= -6.25x10-6 m3C-1 and the relative dielectric constant . (c) If 100 volts is applied across a 1 cm cube of Ge crystal under these conditions, approximately how much current is observed? (d) What is the approximate value of the diffusion coefficient for the electrons and holes? (a) The electron and hole mobilities in a Si sample are 0.135 and 0.048 m2/V-s respectively. Determine the conductivity of intrinsic Si at 300 K if the intrinsic carrier concentration is 1.5×1016 atoms/m3. The sample is then doped with 1023 phosphorous atoms/m3. Determine the equilibrium hole concentration, conductivity and position of the Fermi level relative to the intrinsic level. (b) The resistivity of an intrinsic semiconductor is 4.5 Ωm at 20°C and 2 Ωm at 32°C. Calculate the energy band gap. where A= 10-39 Jm2 . An electron with wave vector k= 1010 kx m-1 is removed from an orbital in the completely filled valence band. Determine the effective mass, velocity, momentum and energy of the hole. (b) In intrinsic GaAs, the electron and hole mobilities are 0.85 and 0.04 m2 /V-s, respectively and the corresponding effective masses are 0.068 m0 and 0.5 m0, where m0 is the rest mass of an electron. 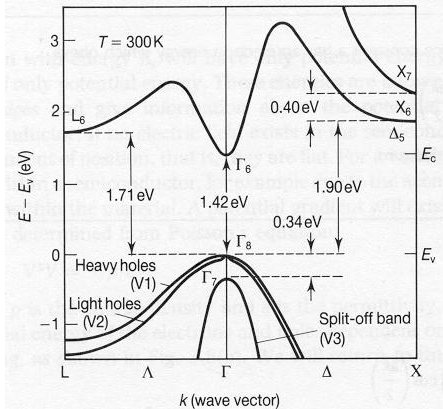 Given the energy band gap at 300 K as 1.43 eV, determine the intrinsic carrier concentration and conductivity. This corresponds to a constant energy surface that is ellipsoidal, but is not an ellipsoid of revolution; the cross-sections in each of the three coordinate directions are ellipses. where Eo= 1.5 eV and a = 5Å. What are the group velocity and effective mass at the following points in this band structure? where A is a constant, and a is the lattice constant. An electric field F is applied along the axis of the crystal (the x axis) in the positive direction. Assuming that the crystal is perfect and there is no scattering of the electron, write an expression for the velocity, v, of the electron as a function of time. What resistance in parallel with 120Ω results in an equivalent resistance of 48Ω. Determine the resistance between terminals a and b for the network shown in Figure.